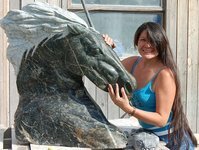 Aboriginal stone sculptor, painter, artist - I collect my stone from my own quarry. I can see images in the stone almost like a spirit then I carve it out. I know exactly where to carve. If I do not listen to what I see then the stone breaks.